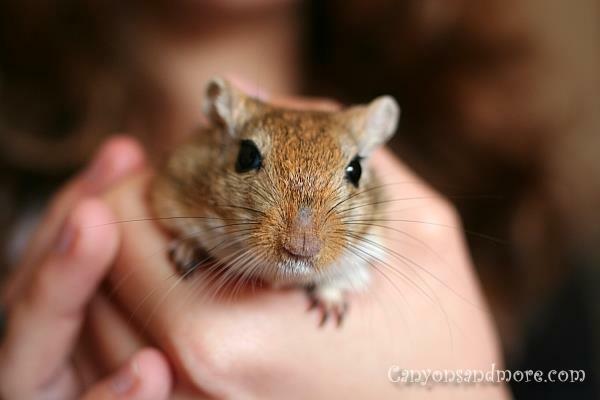 Gerbils make wonderful house pets especially for those who work all day and for those with older children. They are easy to care for (need daily fresh food and water and a clean habitat every 2-4 weeks) and are so fun to watch as they scramble through their aquarium or terrarium. 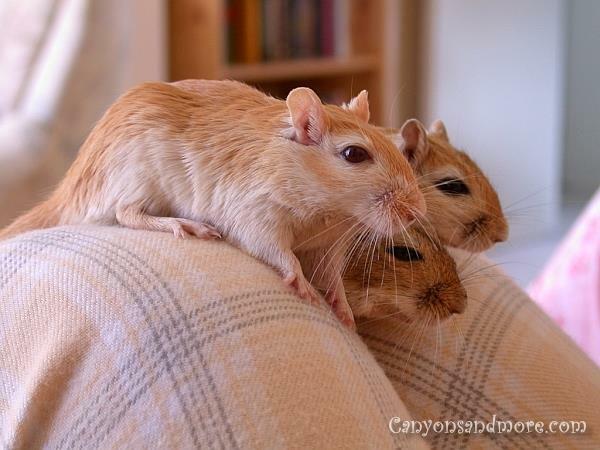 Gerbils are also very playful and full of energy. It is important that they have deep wood shavings to dig in to as they love to burrow and build tunnels. These two little guys in the image above are Blackie and Blondie. These little sweeties are just as cute as they are fun to watch. At the beginning, we rescued the blonde gerbil. 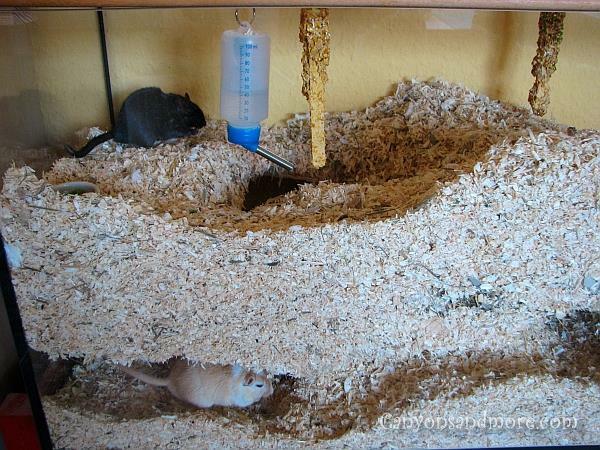 Because gerbils are social animals, they should not be kept alone. So a partner was needed for him. But gerbils just do not accept just any partner. A strange new gerbil cannot be simply added. They have to be first socialized with a new partner which is not as easy as it seems. It could take weeks for this process. But once the socialization was completed, these two guys were friends for life. Blondie and Blackie lived together in a large aquarium that was filled deep with wood shavings and straw. Additional tissues were given to them. These were then shredded by the gerbils and used for padding in their nests that they slept in. These boys both built the most fantastic tunnels. The advantage of having an aquarium was that we could see how complex the tunnels were and it also keeps drafts away from the gerbils. The girls lived in a separate aquarium and were never so into building tunnels like the boys were. That goes to show just how different the personalities can be. It is adorable to see them sleeping in their group as they all will snuggle up together in what looks like a large furry ball or a pyramid. If you secure your room from electrical wires or escape possibilities, you can let them run around as they are very adventurous and curious animals and enjoy the “freedom”. If you sit on the floor amongst them, they also like to crawl over your legs, too. They will be a bit difficult to catch again so patience is also required. 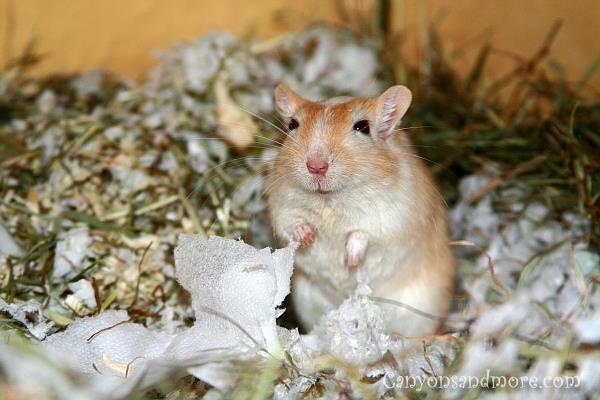 Blondie was a rescued gerbil that had been mistreated and no longer had any mates. He had to be socialized and “Blackie” was the chosen partner for him. It took about 4 weeks to socialize them both, but after the process they finally accepted the other as if they had always been together. 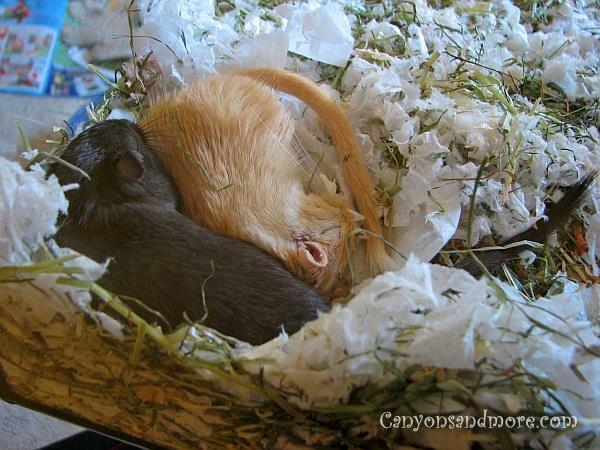 The two gerbils were then unseparable. Blondie was nicknamed the “General” because he was always on alert when one entered the room and thumped his foot loudly to warn of “danger”. 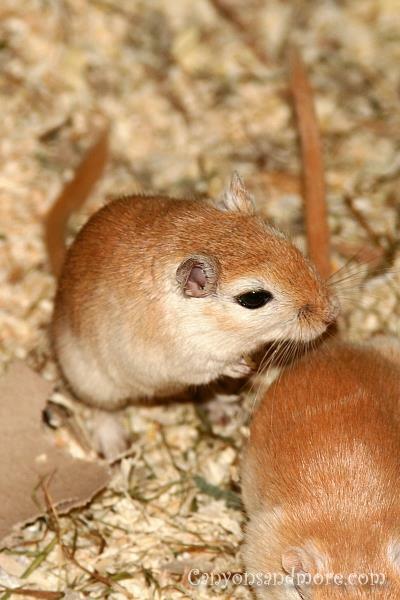 Gerbils are very socialized and most happy in a group of siblings so it is best to buy at least 3 or more together. This guarantees that if one were to die at some point, that two gerbils are still together. Also, buying a group of Gerbils is important because the already know each other and normally get along. Never add a stranger (new gerbil) to an established group as they will attack and seriously injure or even kill the new gerbil. The new gerbil will need to go through a socialization process before adding it to the group. This process requires a lot of patience and time. 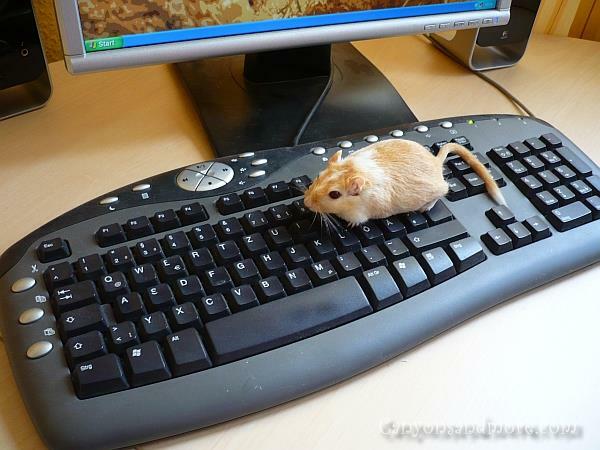 Ask your pet shop or experienced gerbil owners how to socialize gerbils. These were a group of sister gerbils given to us by a friend. Their names were Baileys, Muffin and Bitey. 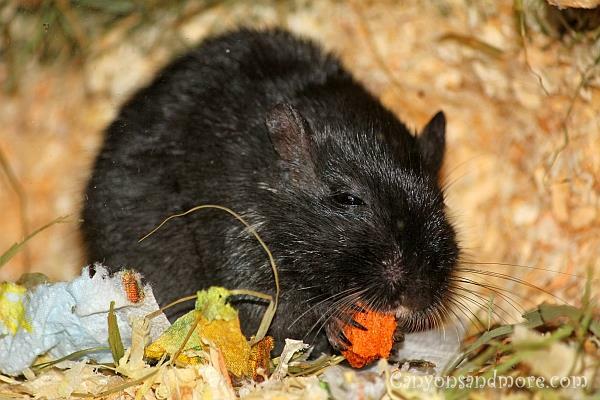 Gerbils can live from 3-6 years, from our experience. As small as they are, they can surely win your heart over with their energetic and cute ways. When a gerbil passes, it is not just “another mouse” that died, but also as sad just as if a dog or cat had passed. Each gerbil has its own personality. Some are gentle and like to be held and others will tend to bite so it is a trial and error situation. Gerbils are not generally recommended for younger kids. This is Muffin, the brown and white agouti. Muffin was our favorite gerbil. She was gentle, tame and liked to be held. She also got along well with her siblings. She lived to be 5 years old. Her siblings were “Baileys” and “Bitey” and were from birth on together. Baileys was also a tame but very active gerbil. 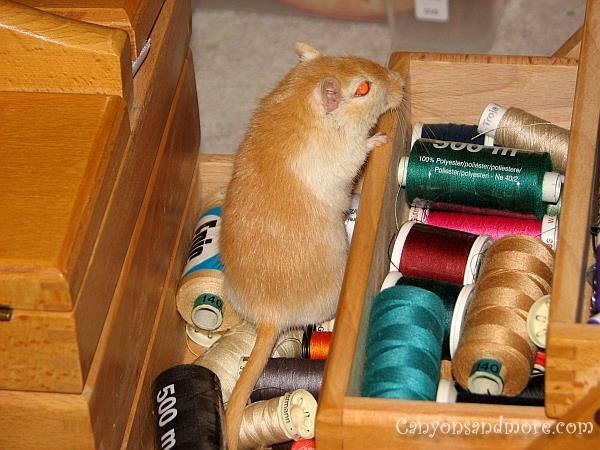 When she had her freedom, she explored everything in sight, as she is doing in the image with the sewing box. Just as her name says... “Bitey” was a biting gerbil and did not like to be held. She still was very cute to look at. 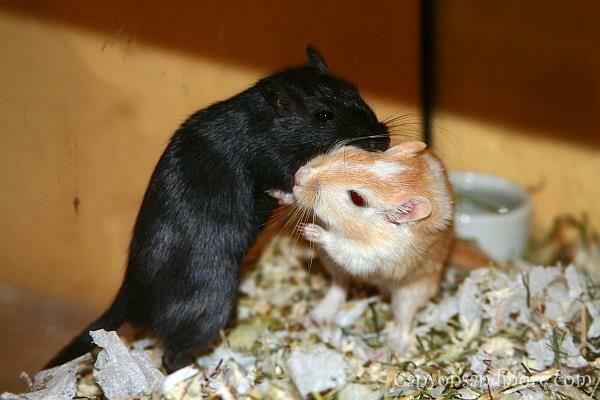 Blackie was Blondie’s new mate and was also a gentle gerbil and such a pleasure to keep. Here he is enjoying a cut up piece of carrot.